This year marks the 20th anniversary of the 1984/85 miners strike, arguably the most important working class struggle of the twentieth century. Some have seen the miners strike of 1926 and the subsequent general strike as a greater potential revolutionary movement. I wouldn't argue with that, for a brief period the state and the misleaders of the trade union movement held their breath, while the tanks were mobilised on the streets and the military took up position while workers followed the call for class solidarity. But the moment was short lived, in its revolutionary potential anyway, for the miners it was to last 9 bitter, betrayal and starvation filled months. The 84/85 movement, however, posed a far greater physical challenge to the guardians of law and order, in terms of confrontation and mass movement of workers taking to the streets to challenge control by the state. In terms of rank and file control (at least initially) and involvement of the whole community, the offensive by the women of the coalfields and sometimes the children, establishment of miners support groups across industry and the labour movement, the world wide mobilisation of solidarity support and sometimes action, 84 was far more an actual movement, politicising vast numbers of people, both within and without the pit communities. (Of course 26 had its moments, derailing the Flying Scotsman, was unmatched by anything we pulled off in 84 for example). The pit communities were ‘closed’ communities in the sense that, mining isn't a trade you just come to out of the blue. It is a profession passed on father to son, in many cases for generations (women and little girls had worked in some coalfields, but by the 1840s were prevented by legislation from underground labour, pit brow women continued into the 1960s). It carries with it, its own culture, its own view of history and how that has impacted upon the mining communities. When miners spoke on public platforms during the strike, of ‘the struggle of our fathers and grandfathers’ most academics assumed they were talking figuratively, but they weren't, they were talking actually, about the impact and perceptions of struggles which had gone before. The effect of this was to ensure mining communities were already highly politicised, with deep class perspectives and socialist traditions. It had been scarce ten years earlier the Edward Heath government broke its back on the miners strike, and twelve years since they had wrecked his incomes policy. So the miners and their families entered this struggle well aware of the scale of the challenge being mounted. Although some had taken some convincing at first, by March 1984 few were unaware that Thatcher was moving in to smash the social power of the miners by breaking their union in an all or nothing confrontation. Almost universally the ‘left’ has cited the decentralised nature of the National Union of Mineworkers (NUM) as a weakness. This is a strange view indeed, without the semi-autonomy of the miners areas, the strike in the form it was launched could never have happened. Behind the view is a notion that some how the miners could simply be ordered out on strike by a national leadership running a national union. They would never have worn that, which is in part why the old Area structure and strong branch autonomies remained. Ever since Margaret Thatcher was elected it was clear her whole strategy at home would depend on being able to heavily defeat the unions. Most had responded to this perspective by staying out of sight and hoping she wouldn't notice them, with the miners she and her party strategists had long planned to take them on as a prelude to her whole social and economic programme; the miners had to be fought and defeated (most will perhaps be aware of the Myron Plan and Ridley Commission, strategies drawn up following the defeat of Heath to take on and defeat the miners in the future, using scab drivers, mass policing, an anti-strike movement and support for a nuclear alternative). A steady game of chess had been stalking the board for three years prior to the outbreak of the strike. The union leadership had been trying to forge a strategy which would take the miners as a united national body into conflict with this government, on our terms, but it had failed. Failed because although the miners were a militant bunch, and would fight on wages and conditions when they felt particularly aggrieved, they had never really been too arsed about fighting pit closures. Hundreds had closed over the preceding twenty years, the failure to fight this was only partially due to the collaboration of NUM leaders, the other was down to the ambivalent attitude of the miners to pit work. We didn't actually like the pit, we didn't actually like working on god awful shifts, in crippling dust and heat in cramped and wet conditions. True we were all proud to be miners, but that didn't mean we liked working down the mine! So fighting for jobs, especially these jobs was never going to be a catchy slogan. NUM leader Arthur Scargill had disastrously tried to link the question of pit closures to pay rises together on a single ballot paper, in the hope that the desire for the latter would deliver up a mandate on the former. The members were furious and felt they were being conned, and the strategy backfired. The National Coal Board (NCB) for its part was also wrong footed, for a start they were not sure what the aim of a showdown was about. Most senior managers would agree the union was too strong and needed its wings clipping in a showdown, many would agree there was surplus capacity in the industry and it required fine tuning, perhaps a little surgery. Few on the NCB side would agree to any perspective of decimating the industry or stomping the union out of existence, the bulk of them had come up through the ranks, and themselves were generational pit folk, albeit ‘on the other side’. What the bosses of the Coal Board hadn't realised was that this whole strategy was aimed at destroying the NCB as an organisation, and with it, most of them. For a time it looked as though, the NCB would concentrate on taking out ‘capacity’ (shutting pits) in areas were they figured they could get away with it, Durham, Northumberland, Scotland, Wales. Rank and file efforts to generate a major fight back on closures in these areas failed to move, with great residual bitterness. Polmaise in Scotland, Bear Park in Durham, Lewis Merthyr in South Wales all had tried to demonstrate the need for solidarity action and a national stand. At Lewis Merthyr pickets had started to be deployed around the country. At Hatfield Main in Doncaster the Women's Support Group was founded to lobby for support for strike action for Lewis Merthyr and the branch voted to strike. The Doncaster panel was calling for strikes in the entire Doncaster coalfield in support, but other parts of Yorkshire were hostile. 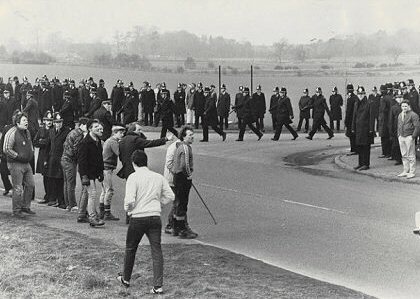 The South Wales Area came out en masse and the strike was endorsed under rule 41 by the National Executive Committee, the way was open for South Wales to then picket out and call for support from the other areas. However the demand for a national ballot was acceded to and following the usual press propaganda war, warning of hell fire, and murder, the vote was lost by 61%. The NCB could continue its selective surgery without confrontation. That was not the strategy however, and under Thatcher’s orders, industrialist Ian MacGregor was called in because Thatcher didn't trust the NCB chiefs to do the scale of closure and conduct the fight to the finish with the NUM. The US imported undertaker [originally brought to the UK by the Labour Party on the board of British Leyland] threw down the gauntlet in Yorkshire - Cortonwood would close in days, what are you going to do about it? The Yorkshire miners as a whole had been very reluctant to fight for miners elsewhere, it must be said, but now the challenge was at home, and it was clear this was a fight, initially yes for 50,000 jobs and 50 pits, but also whether or not the remaining miners would have any backbone, what sort of regime would remain for the survivors and would we have a union at all. Those things were worth fighting for. Again an area strike was called by pit delegates and at mass meetings throughout the coalfields endorsed at the pit head in a show of tens of thousands of hands, although there had also been a successful ballot in the Yorkshire Area three years earlier. Again the NEC approved the action under rule 41 and the Yorkshire pickets set off to call out their fellow miners in all the other areas. This time we would not respond to calls for a national ballot. Other areas joined the action, some very reluctantly and picketing and mass meetings seen strong arguments, especially in Wales were the miners had felt particularly let down by Yorkshire, but within a week 80% of the miners and 134 pits were on strike nation-wide. At the others despite calls to support the strike, and with the active assistance of Thatcher’s strike breaking teams and undercover agents, an anti-strike movement later an anti-union movement was developed. What must be remembered is that this uneven response by key areas was not an accident, it had been designed to happen, and designed by the former Labour government. The miners strike of 1974 had brought down the Tories and imposed a Labour government, but the miners had refused to call off their strike during and after the general election. The implication was clear to any government, strike action could shift governments, and it needn't be once every five years. Power resided elsewhere other than in parliament. The working class as a class had power if it wished to exercise it for political and class ends. Labour didn't like this any more than the Tories and had set up a think tank to design strategies to ensure this didn't happen again, just as the Tories had done in fact. Chief target of the strategists had been the centralising, unifying, feature of national pay bargaining. It meant that miners wages and conditions for the first time were debated on a single national table by a single national union body representing all the areas. It had ended area disparities and area inequalities. National pay bargaining had meant for the first time that a miner in the Scotland could be paid the same rates for the same class of work as a miner in Kent, or in any one of the far flung coalfield areas. The eyes of the miners in all areas, and the strength of their resolve would be unified in one union around conference decisions. It had been this feature, brought about by the National Power Loading Agreement of 1963 which had cleared the way for successful strikes in '69, '72 and '74. It was this feature which Labour now moved to break. This it did by introduction of the Area Incentive Schemes, over the top of national conference decisions and against the decisions of national ballots. The Midlands and Nottingham in particular ignored ballot decisions and with the green light from NUM leader Joe Gormley, effectively a fifth columnist, the area incentive scheme was adopted, entirely unconstitutionally. Wages and conditions, as well as perspectives for the future, would now be locally coloured to a large extent. Area strategies would be seen as more important than national ones. Old fault lines, first established in the anti 1926 strike movement, the anti miners union of Spensorism which had been established in Nottingham, now opened up wider with the generous payments of incentives in selective areas. Nottingham and Leicester convinced themselves they had a long term future of their own, the other coalfields areas were not of concern. This "I’m all right Jack" attitude was crucial in dividing miner from miner and area from area, but it had been created as a political and social ploy, it wasn't some natural development. Some have made the ballot the central issue of the strike. Of course it wasn't, but it is important to understand the degree to which the rank and file dictated tactics during this strike. Many in the leadership had seen the picketing operations and the semi-official nature of the strike movement as a temporary measure, a kick-start to get the thing rolling on a more official basis. Once the strike started, and the full design of the other side revealed, once we were able to let the activists hammer home the message of the gravity of this situation, once the bulk of the rank and file were fully convinced of the necessity to take this on, we could then call a national ballot. Wrong, although a special conference was convened in Sheffield, and a rule change had gone through conference to change the rule requirement for national action from 55% to 51%. The members now on strike could see no need for any ballots. They thought we in the leadership of the union were trying to sell them out, were looking for an excuse to call off the strike. So they instructed their delegates at pit after pit to vote against a national ballot and to continue the strike to victory. It was an entirely understandable reaction, but in retrospect a mistaken one. A national ballot at this stage of the struggle, with emotions running high and the bulk of the collieries at a standstill would without any doubt whatever have won a massive strike mandate. Of course this wouldn't have stopped the hardened scabs going in, nor stopped the reactionary forces operating in Nottingham trying to break the union and the strike, but it would have robbed them of their legitimacy, and taken some of the edge off the excuses put forward by other unions showing only lukewarm support or outright scabbing. For a time, the pickets spreading out in brilliant manoeuvres from coalfield to coalfield and pit to pit, rolled all in front of them, the sheer buoyancy of confidence of the pickets won over by far and away the bulk of doubters in coalfield after coalfield. Even in Nottingham where only a minority, perhaps a third of miners actually actively supported the strike, men refused to cross picket lines and were, if not happy to go home, at least went home without too much fuss. Solidarity started to come through strongly on the railways, and among the seafarers. Some power stations started to realise that our jobs were literally their jobs too and took blacking actions. Thatcher’s reaction was the drafting of a de-facto national police force, which would be given its head to do anything it had to do to stop the pickets getting through, and to break up picket lines. The police were signed up as the NCB's own security firm to ensure scabs got to work on time and in one piece regardless of numbers and costs. Roadblocks and curfews were imposed and the striking villages were saturated with an occupying police force. Government strategies were then based around getting at least one scab into every pit in Britain. In Yorkshire, this would be the major diversion, along with the Orgreave steel coking plant. These police second fronts would stop the pickets in Nottingham and allow the scabs to work and coal to be produced. The bitterness of escalating violence and counter-violence is now legendary, but what it did was open up political ideas on class violence, on counter violence, and the justification for armed struggles. The IRA, for example, only lost sympathy during the strike when they failed to kill Thatcher and her cabinet. The scab herding taxi driver's death in Wales was seen and justified almost everywhere as a legitimate action which had simply gone wrong, a casuality in a war which had already claimed two of our pickets without any such fuss in the press. The hypocrisy over Libyan financial assistance for the strikers, when Thatcher was pouring extra oil in from every despotic country in the world, all were educations in the real class divide in world events. Across the world, working people mobilised in solidarity with the British miners and their families. The scale of the operation is breathless, Tens of millions of pounds were raised and distributed through rank and file networks of women, and local support groups. Families fed, clothed and cared for 12 bitter months of struggle. Sympathetic councils suspended rents, kept school canteens open during holiday months, and did what they could, whilst on the other side the DSS stopped benefits and found ways to force real poverty on people's welfare entitlements regardless of age. The nature of this state started to be revealed in very real terms, and that wiped some mist from the eyes of many about places like Ireland, and what was going on there, the struggle of black people down in London and other places. Social roles were starting to be challenged. Women not only ‘manned’ soup kitchens and the welfare infrastructure but argued among themselves about strategy, pickets, slogans, marriage and kids and ideas in general. Would groups be ‘ladies’ or ‘wives’ or ‘women’? Sexual stereotyping, attitudes to gays, religious groups, everything which had been taken for granted was now no longer taken for granted. Victory was within grasp, we could feel it and taste it. Thatcher and MacGreggor have both admitted as much. If the National Association of Colliery Overmen, Deputies and Shotfirers union (NACODS) had implemented either of its mass pro-strike mandates, if the dockers had continued their blacking actions just days longer, if the TUC had implemented its national conference decisions, we would have won hands down. Just think of what that victory would have meant in political terms, in class terms in social terms, coming at the end of such a polarisation of class forces and determined action on both sides. Twice in ten years an industrial union based on a community would have smashed a government policy and almost certainly would have smashed the Thatcher government too. Think of the consequences of that. The other side, not just the Tories and their establishment, but the whole parliamentary circus, of Labour and Liberal trembled. That we didn't succeed was a consequence of conscious traitors in the trade union leadership, particularly in power stations, and steel works and among NACODS who saw and chose a side, consciously joining in to ensure the defeat of the miners. But it was also action by those individual workers who could not see the consequences, refused to see anything but their own selfish greed, which derailed us. At the end of the day, the dockers at Immingham, who allowed non union non dockers to load coal onto scab lorries, and in the process smashed their own dock labour scheme, and most of their jobs nation-wide. The power station workers who scabbed every day, and ultimately saw two thirds of their own jobs go with the closure of the coal fired stations. The coking coal plants like Orgreave that worked on through the cavalry charges and pitched battles at their gates. The blackleg miners in Nottingham and Leicester, thrown on the scrap heap and their own pits closed and communities decimated. The armies of female office workers, whose wages and conditions came from being part of the white collar section of the NUM. Whose allegiances and inflated self opinion however kept them working right through the strike, collecting money and donating flowers to the nice policemen only to discover if you don't need coal mines, you don't need coal mine HQs and blocks of offices, and finally joined the miners... on the dole queue. The scabbing steel workers in Scotland Wales and Yorkshire, all closed down and dead and buried. Scab mercenary lorry drivers spreading strike breaking, from the miners, through the dockers, and the print workers, through animal activists, through nuclear campaigners and presiding over destruction of social communities and solidarity and compassion. Certainly it was a fight we had no choice but to undertake, a battle the working class will never forget, and one we certainly didn't deserve to lose, for these ordinary folk, not trained soldiers or wild eyed zealots, had laid everything flesh and blood and even life could offer on the line. They had no more to give. Visit the former pit communities today and you will still see the results of that defeat, although come to think of it, visit almost any workplace in Britain and you will see it too. We must never forget who were our friends and who were our enemies in that war, nor the need to start seriously looking for the means of taking our revenge. Yes we will cheer when Thatcher kicks the bucket, but it's the whole stinking system she fought for and defended which needs to go to the grave with her. That would be a lasting legacy for the pit communities of 84/85. First published in Black Flag. Lightly edited by libcom for typos, grammar and some clarifying information such as full names and acronyms.